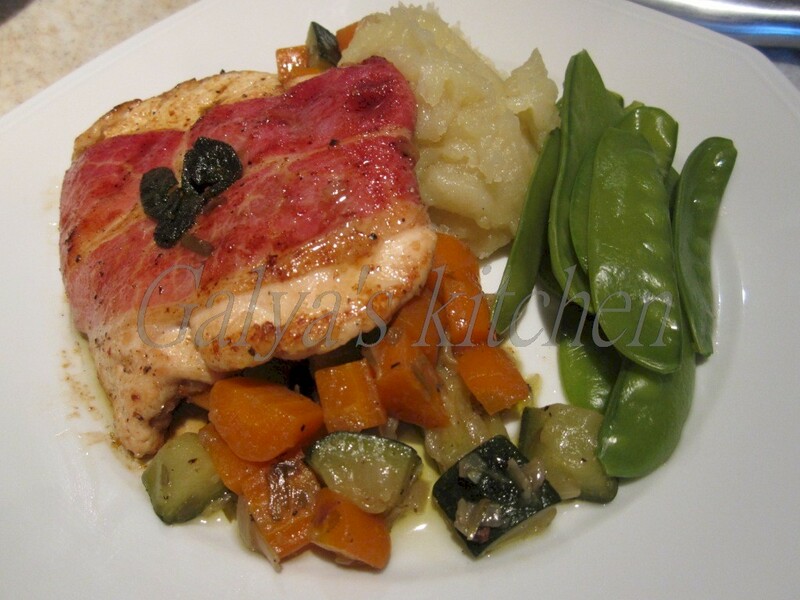 Saltimbocca is very popular at La Croix du Reh especially in summer. First I’ve heard about this dish was when I watched one of the popular TV cooking shows. It appealed to me by its simplicity and the fact that it could be prepared in advance and cooked at a last minute. Saltimbocca (or saltinbocca) translates from Italian: jumps in the mouth and probably is of italian origin. Traditionally it is made with veal , prosciutto and sage, sometimes rolled-up and cooked in white wine, which makes it saltimbocca alla Romana ( Roman style). As veal can be quiet expensive, I use chicken breast or chicken cutlets ( which are cut flat) , thin sliced smoked cured ham and Marsala wine. 1. Place the chicken breasts between two sheets of cling film and flatten them with a rolling pin to approximately same size. 2. Lay a piece of parma ham on each tucking both ends of the ham under the meat. Top with three sage leaves and secure with a toothpick. Sprinkle with some freshly ground black pepper. 3. In a large frying pan, heat 1/2 of the butter on a medium heat. Once hot, place the saltimbocca into the pan, sage side down. Cook for 2-3 minutes until browned. Turn and cook for a further three minutes until just cooked through. 4. Once ready, transfer the saltimbocca to a warm plate and cover with foil. 5. Pour the Marsala wine into the hot frying pan and and tip the pan slightly over to ignite ( flambé ) the wine (please take care to not to burn yourself). Once the flame has gone, deglaze the pan and leave the liquid to simmer for couple of minutes until slightly reduced. *If one is not comfortable with making the flambé, just simply deglaze the pan with the wine and simmer a little until slightly reduced. 6. Quickly stir in the remaining butter . 7. Return the chicken and any juice to the pan, leave in the sauce for 30 seconds. 8. Remove the pan from the heat and remove the toothpicks from the saltimbocca. Serve with some mash potato and salad or vegetables of your choice.